I'm switching from a "base three" to a "base four" chart, meaning that the boxes now represent four hour blocks of time. Roughly. To deemphasize the proportion of WORK during the week. Which is to say nothing about the proportion of SLEEP, which I'm now showing. Look, that is how much you sleep & this is how much is left, this is what you have to work with. I know that's not what base four means. I'm lucky, actually, that work takes just a third of my week & just weekdays at that. Everybody else in my office works sixty hour weeks pretty regularly; usually even if you're nonexempt, your forty hour work week is forty hours like a two-by-four is two inches by four inches. But I actually do sleep eight hours and work eight hours. Like literally, I go to bed at 1:00 AM, get out of bed at 8:00 AM and leave the house to ride my bike to work at 9:00 AM. I leave work at 5:00 PM and ride my bike home. Then, play for eight hours until it's time for bed. This is "play" pretty widely defined to include, like, doing the dishes sometimes. Which I keep down by, you know, almost never cooking. You know in Australia, they have this huge deal about the 8-hour working day as a kind of victory for the unions, it's a big thing in their history. There's actually a monument to it in Melbourne somewhere. So the chart would go: 8 hours work, 8 hours play, 8 hours sleep. 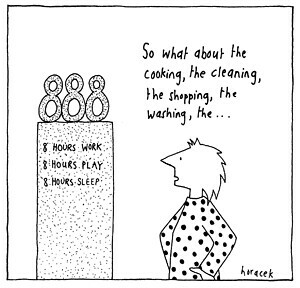 Judy Horacek (who is an awesome Australian feminist cartoonist who you should check out if you don't already know her work, her web page is: http://www.horacek.com.au/) did a cartoon about it which I am attaching for you because I keep thinking of it when I read your blog. By the way the bike ride to work counts as work, and the bike ride home counts as play.